Jewish leaders express deep concern about growing support for neo-Nazi parties in European parliaments. Prominent Jewish figures have expressed deep concern after the latest neo-Nazi party was elected in a European national parliamentary. The Our Slovakia party gained 14 parliamentary seats in Slovakia's recent elections, taking its place at the National Council for the first time. The far right extremists scored 8 percent in an election that failed to produce a majority result. European Jewish Congress President Dr. Moshe Kantor explained that hate-groups disguised as democratic parties are entering European parliaments. "This is an extremely worrying trend and something that all moderate parties and politicians from the Left and Right should work against." “There should be clear red lines placed on their full participation in the parliamentary process, chairing committees or entering coalitions,” said Dr. Kantor. 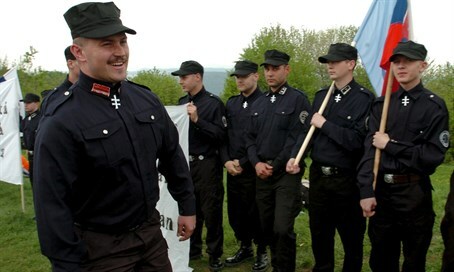 Our Slovakia is the latest neo-Nazi party to win in a European national election after Svoboda in Ukraine and Golden Dawn in Greece, in addition to European municipal level far-Right parties.